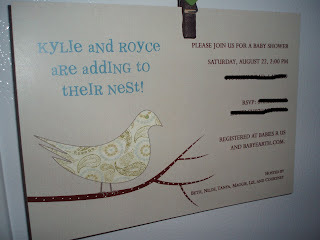 We had such a fun baby shower for our friend Kylie this past weekend. I thought I would pass on some of the pictures. Here is the invitation designed by the extremely talented Mary Jo Green of What's inside Designs. We had cupcakes of course. This idea came from Martha Stewart's site. I made carrot cake cupcakes with cream cheese frosting and toasted coconut. The food was as delicious as it was colorful. Beth put together this wonderful photo garland of the happy parents-to-be. Here is the beautiful Mama and Grandmother as she opens a baby quilt made by her Aunt. It's always so exciting to celebrate another one of God's creations. We can't wait to meet baby Ezra. 2. Your cupcakes are AMAZING!!! !